The aim of SANIRESCH (SANItaryRecycling ESCHborn) was the treatment and recycling of the urine, brown- and greywater collected at the main building of the headquarters of Deutsche Gesellschaft für Internationale Zusammenarbeit (GIZ) GmbH in Eschborn, Germany. Technologies for the treatment of wastewater streams (MAP precipitation, membrane bioreactors) as well as reuse in agriculture were developed further within this project. Moreover, important questions regarding the further development of sanitary equipment and installtions, the operation and maintenance, the user acceptance, the environmental and health risks of the reuse, the economics and resource efficiency as well as the legal conditions and the transferability of such technologies to other countries were investigated. 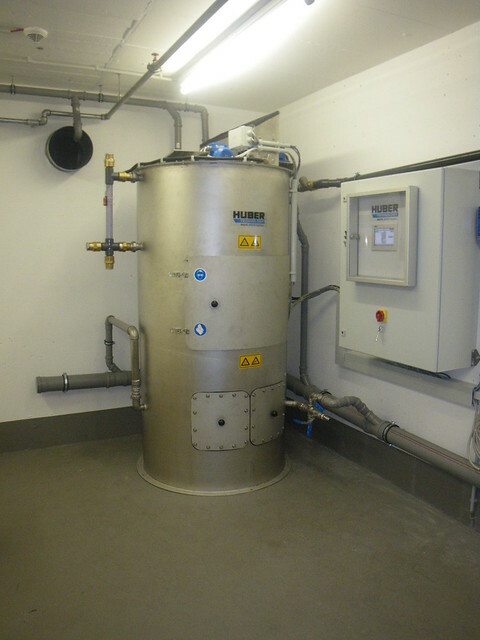 The GIZ implemented a system for the separate collection of urine and brownwater during the renovation of the main building (Building 1) of the headquaters located in Eschborn. This system consisted of urine-diversion flush toilets, waterless urinals, separate piping systems for urine, brownwater and greywater and tanks for urine storage. SANIRESCH was financed by the Federal Ministry of Education and Research from July 2009 till December 2012. The project partners were the THM University of Applied Siences, the Deutsche Gesellschaft für internationale Zusammenarbeit (GIZ) GmbH, Huber SE, Roediger Vacuum, RWTH Aachen, and the University of Bonn. The project consists of different components, which are driven by different partners either alone or in cooperation with another partner. Read more about project components here. At this part of the website documents and publicatons are made available for download. If you need some more Informations please feel free to contact us.